Is no longer massive. I know there's going to be comparisons and complaints that she's no longer titan sized, but I'm personally happier with this smaller scale as, unlike the larger version, this one is able to stand without assistance and has better articulation. 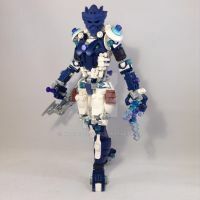 i am making a Bionicle G3 Idea. it Take place after the Events of journey to one. the island of Okoto has Been shattered to different islands by a mysterious force. so the Toa are needed again. however this time the journey will be different. instead Looking of the elemental masks or the creature of the elements.. this time The Toa have to find a element temple in the respective islands and search for the legendary elemental weapons of Okoto. and find out this mysterious force and this time.. is not the master of shadows who is pulling the strings is something else then him. I quite like the change. The titan version, while cool, didn't appeal to me as much as the shorter versions. This is by far a real step up. Fantastic as always. Ooooh that entire torso area is shaped amazingly. Also dem round tiles FTW. Looks impressive! Also screw anyone who complains about size, it should never be a problem having things a bit smaller than usual if you can make it that size. I should do this with my Character Ahiko. He’s a titan but It’s such a bother to scale such massive characters. I love this too; the way you take your artistic vision on paper and recreate it using Lego. It’s great. Inspirational. It’s a lot nicer though. With a Titan it can tend to be a factor of quantity over quality; way more stressful. Also, using Masks tends to necessitate large Mocs because it makes the head look big, and body proportions ya know? Wow great work! I love the print on the face plate! Fantastic work! Never give up!